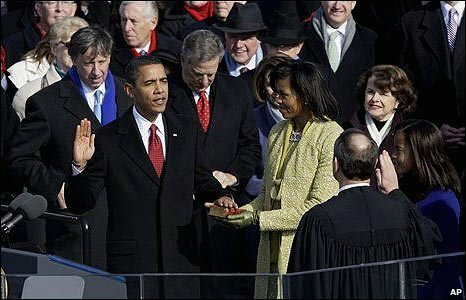 Barack Obama has been sworn in as the 44th President of the United States of America, at a historic ceremony in Washington DC. 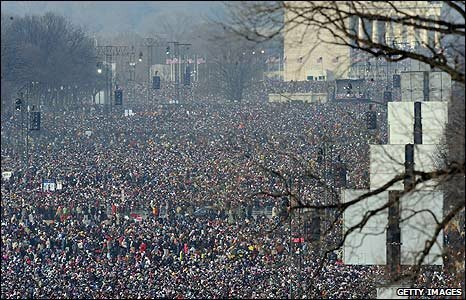 Millions of people in the US and around the world watched as he pledged to "preserve, protect and defend" the US constitution. 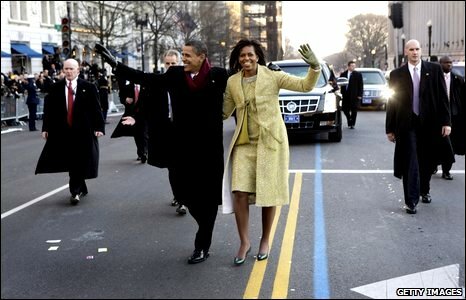 Mr Obama and First Lady Michelle Obama then travelled to the White House in an Inaugural Parade. 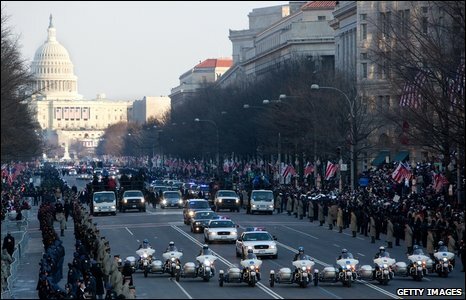 The motorcade stopped and the couple stepped out of the car and walked, waving to the hundreds of wellwishers lining the route - many of whom had waited 10 hours in the cold. 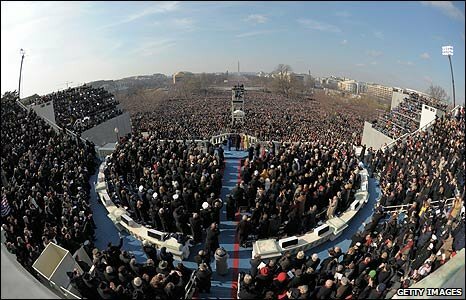 Earlier in the day, those gathered in Washington's National Mall erupted into cheers when Mr Obama appeared on the inauguration stage. 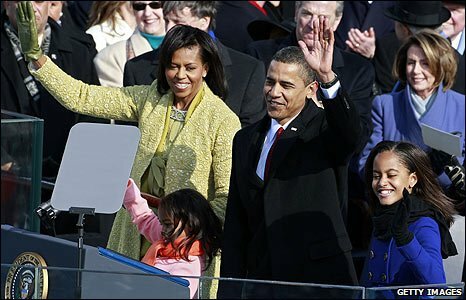 The new president was joined by his wife Michelle and his daughters Sasha and Malia, who will be the youngest White House residents for many years. 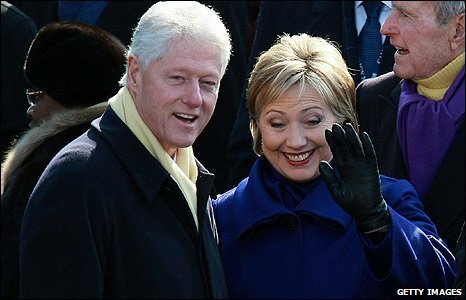 Also on stage were Mr Obama's former rival for the Democratic candidacy and probable future Secretary of State, Hillary Clinton, and her husband, former President Bill Clinton. 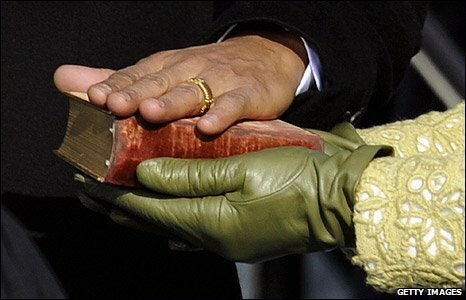 Mr Obama swore his oath of allegiance on the same Bible used by Abraham Lincoln at his inauguration in 1861, held by the new First Lady Michelle Obama. 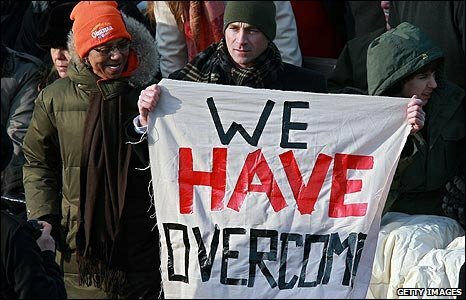 He used his inaugural speech to say the US was entering a "new era of responsibility", and vowed to begin the work of "remaking" the country. 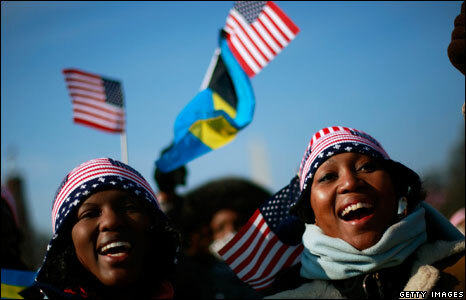 Mr Obama made reference to the scale of his achievement at being the first black American elected to the White House, in a remark that gathered one of the biggest cheers of the speech. 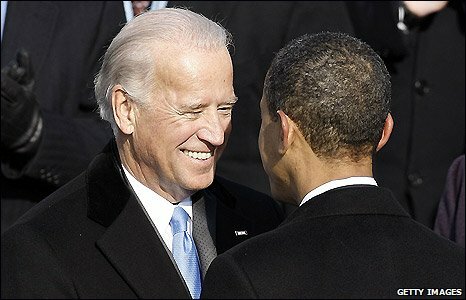 The newly-sworn in Vice-President Joe Biden congratulated Mr Obama on his new role. 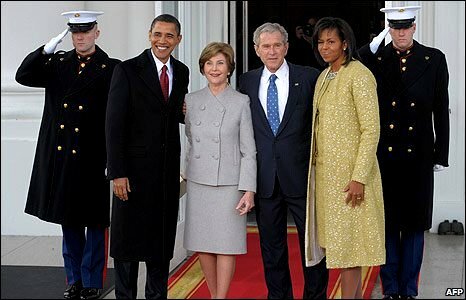 The now former President George W Bush, who has been commended by many for the smooth transition of power to Mr Obama, also congratulated his successor. 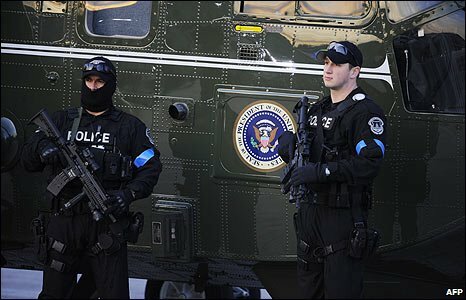 Security was intense, with roads and subways closed and some 40,000 security personnel on duty, including police snipers in position on the roof of the White House. 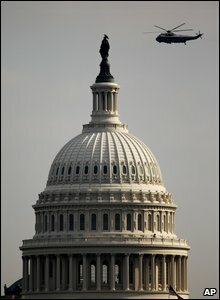 The first couple had started the day with a church service, then travelled to the White House for coffee with Mr Bush and his wife Laura. 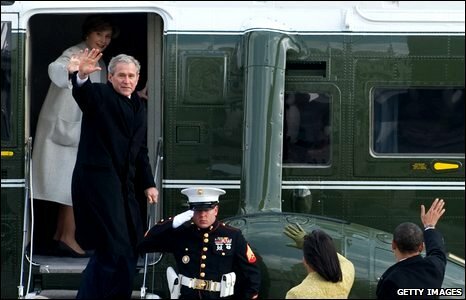 Mr and Mrs Bush left by helicopter bound for Midland, Texas, before heading to the family ranch at Crawford. 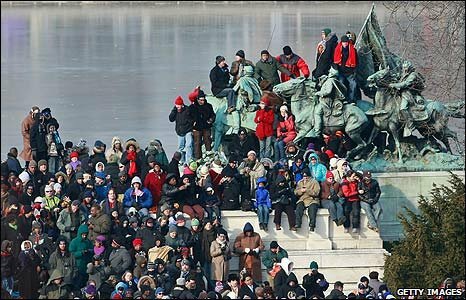 Some had been waiting in the streets of the capital from the early hours, despite the freezing temperatures. 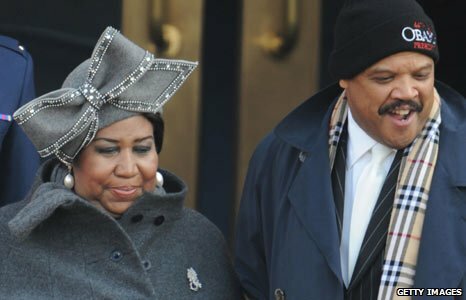 They had been entertained by music from the stage, including singer Aretha Franklin, who sang My Country 'Tis of Thee with the backing of a choir. 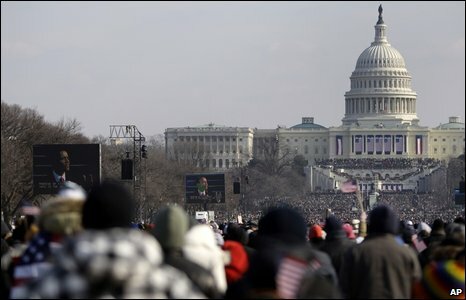 Correspondents said there was a real sense of history among the cheering and flag-waving crowds gathered in the National Mall. 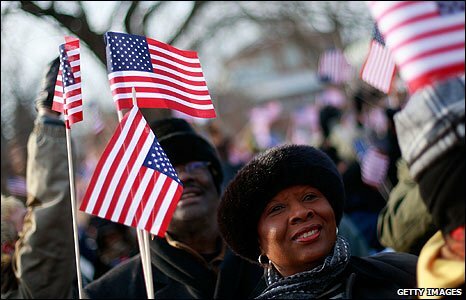 For many Americans, seeing the first African-American president sworn into the White House is a sign of the country having overcome its racially divided past. 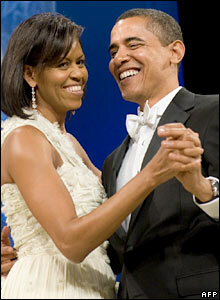 Barack and Michelle Obama then began attending a series of balls traditionally held after the inauguration ceremonies.